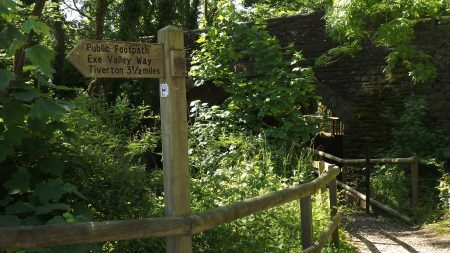 There are a number of walks and trails around Bickleigh Mill – great for walking enthusiasts and those that want to bring their dog along to the mill. With the summer fast approaching, why not bring the family and pets along to Bickleigh Mill and make time for the Bickleigh Castle Walking Route. The route is around 4 miles (9km) and takes around 2 hours to complete. This lovely walking route takes in the beautiful Bickleigh Castle and will take you past a number of local farms and through idyllic country roads. There is a steep hill in the route and a few narrow lanes which are used by the local farmers, so make sure you are alert when taking these roads. A. From the public parking area at the edge of Bickleigh Mill go back, with care, to the A396 and cross the bridge. Turn left down the A3072, following the brown tourist sign for Bickleigh Castle. Take the first lane left, running along the edge of the flood plain on the Exe Valley Way (EVW). Bickleigh Castle will soon be found on the right. Go straight on past Way Farm. B. Just after the buildings of Way Farm turn right to leave the Exe Valley Way, roughly signposted ‘Lee Cross & Perry Farm’. Take care, this is a very narrow lane, carrying busy traffic from local farms. Keep along the lane as it climbs steeply uphill and after 700yds (640m) brings you to the farm at Lee Cross. C. Immediately after the house keep straight ahead along the road. Pass Perry Farm and continue until you reach a T-junction; turn left on to a green lane. Continue on this lane until you reach another T-junction. Turn right. The lane now levels off and becomes easier. D. Where the green lane meets the tarmac lane turn left and proceed steeply downhill (EVW). The views over the River Exe, and to Silverton church beyond, are glorious. Follow the lane down until you see Tray Mill Farm on the right. E. The way home is straight on along the lane, but it’s worth doing a small detour to the river here. Turn right through the farmyard (no sign) and pass through a metal Gate onto a concrete standing. Ahead you will see a suspension bridge over the river; cross it and go straight on to reach the dismantled railway track. Do not turn left along the track – although it would take you straight back to your car- it is privately owned and has no public right of way. F. The path goes straight on here to meet the A369. You can do that, turn left, then eventually right to walk through Bickleigh village back to the mill, but it is a busy road and you would be better advised to retrace your steps to Tray Mill Farm and take the quieter route back to Bickleigh Mill. G. Back on the lane by Tray Mill Farm, turn right and walk straight along the lane, past Bickleigh Castle, turning right at the A3072, and right again over the bridge to return to your car.